Dual-layer fused waterproof fabric, developed by Craghoppers. 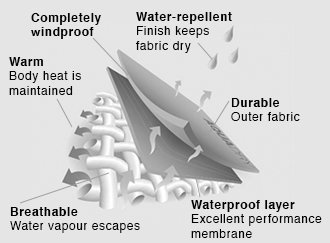 AquaDry Membrane is constructed to provide exceptional waterprooﬁng and breathability in the heaviest of downpours. This top of the range fabric delivers fantastic levels of breathability. It is a laminated fabric – the combination of fusing a waterproof breathable membrane to our durable outer face fabric. The result is a fabric that is strong, yet comfortable to wear. DWR (Durable Water Repellent) ﬁnish helps keep the outer fabric drier for longer. Here at Craghoppers, we advocate any type of adventure - big or small. Whether you're on a casual Sunday stroll, or you're trekking through Peru, share your adventures with us using #MyCraghoppers for a chance to feature on our social feeds. Contact us or connect with us on our social channels.